Fifty items a second were expected to be listed on eBay on January 27 as UK shoppers sold items to afford their next big purchase. To visualise that trend we created a single-page infographic for Shine Communications and its client, eBay UK. 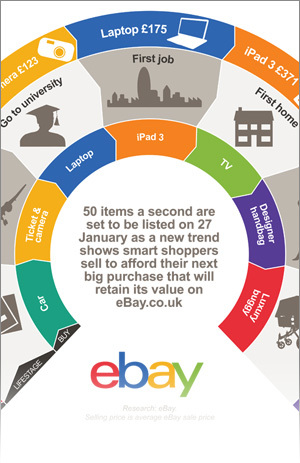 The infographic accompanied eBay’s marketing campaign, and was featured here on Mail Online. You can see a high resolution PDF of the eBay infographic here.